NOW IS A CRITICAL TIME TO INCREASE THE PERSONAL IMPACT YOU HAVE ON COLLEAGUES, CUSTOMERS AND STAKEHOLDERS. 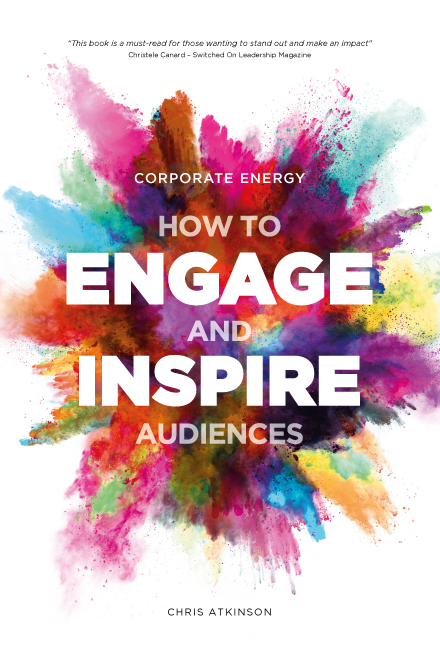 Research into the subject of engagement and inspiration demonstrates the huge impact these elements can have on organisational culture, performance and individual careers. Unfortunately, the weight of research is not matched by clear and descriptive ‘how to’ guides explaining the techniques available to achieve these things. There are few programmes, very few books and mostly it’s been assumed you have either “got it, or you haven’t”. This is the first book to offer a complete guide to the skills and techniques to become a more inspirational and engaging communicator. It is essential reading for anyone who needs to engage audiences whether it be in meetings, training courses or formal presentations. You will learn innovative ways to introduce and discuss content with groups as well as techniques and strategies to energise audiences, transform boring topics and get interest, handle hostile questions or audiences, leverage storytelling as a vehicle for leadership and use novel technologies to engage others.